An air handler works with your central air conditioner to circulate cool air in the summer, or with a heat pump to circulate warm air in the winter as well. 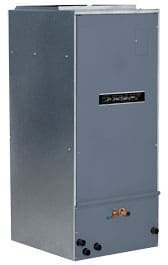 A variable speed air handler helps reduce operational costs and noise levels. It starts up at “low speed,” slowly and quietly moving air throughout your home. Then it silently increases its speed as needed to maintain comfort. By starting this way, it uses less energy and works most effectively, since it will remain at “low speed” for the majority of time. It also greatly reduced noise levels when compared to a non-variable-speed unit. To learn more about our total support for air handler systems, please contact us today.